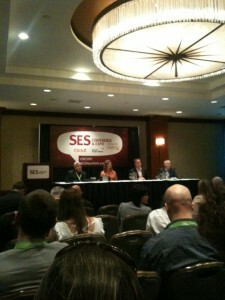 SESNY 2012 Keynote: Integrated Marketing — What Does That Really Mean? Posted by Virginia Nussey on 03/22/2012 @ 6:43 am | Comments Off on SESNY 2012 Keynote: Integrated Marketing — What Does That Really Mean? We start with introductions along with panelists’ views on integrated marketing. @giorodriguez: Integrated marketing is the rise of the connected consumer. Marketing has become more strategic, in large part because of the access to data. @brendafiala: Strategy group in North America – for her integrated marketing is about the platform being the ecosystem, rather than the website. They activate the ecosystem – what’s the global brand and how is it touched across the world. She’s been in all verticals and worked across the globe. @larsfeely: At Ogilvy leads Caesars Entertainment and UFC. IMC to him is about performance, whenever marketers look at a silo, they’re missing out. Traditional buys and social aspect need to be looked at along with SEO and PPC. Integrated marketing is about getting to the success market for whatever vertical you’re in. @huffmanme: Brand building integrated communication – an internal consulting group, helps think through strategy and execution of communication. P&G is in the biz of building brand that’s purpose inspired and benefit driven. They bring this to life with big ideas grounded in the human experience, then amplified with various touch points that build awareness and advocacy. It’s not just “matching luggage” – the same visual everywhere. Big idea vs. big data? Is either the correct approach or somewhere in the middle? Mark: Big ideas is where they want to play. They say they can come from anywhere but they mostly come from ad agencies. He doesn’t know why. Because they perfected the fine art of presentation, but he thinks it’s more than that. Deep human insights is important, and they get a lot of info from going into consumer homes and gathering habits and practices. Fertile ground for getting insights. Example: how many are familiar with Fabreze air freshener? Their new campaign is the Breathe Happy campaign. “Campaigns” for them isn’t a single execution but is intended to last 3-4 years. Breathe Happy is built on an insight that people are strongly influenced by smell and was drawn up on the back of a cocktail napkin. Could big data have ever gotten them to that idea? He thinks not. Lars: Performance and integrated marketing stems from data. Of the moment data is something you can capture anywhere. Look at a timeframe, a keyword, seasonality, buying, not buying, leveraging SEO – insight into clients. Good ideas come from understanding of the product, consumers, and he would doubt they went to market without testing the idea in reality. Your own experiences and collective experiences are data points of their own. Brenda: I don’t accept the either/or premise of your question. What is data and what is a big idea and where do they come from? The depth of data you can get these days is powerful. Looking at behavioral analytics, tracking by person or collective behavior. How do you take it out of the room of the analytics people and planners and inspire the creative people. Popcorn or pinball logic is taking disparate ideas and creating something new. It should come from the analytics. Gio: A retailer that can predict your daughter is pregnant is an excerpt of a book on the power of habit. It helped explode some of the myths around big ideas and big data. This is a bit of misdirection. There is personal data we create everyday. What’s interesting about both is there is a continuum. The ascent of the CMO probably was created by marketers. Discussions today often begin with the question what can you tell me about what customers think. You have to navigate both data and ideas to get to the insight. Mark: “I know a big idea when I feel a shiver up my spine” – that’s a quote someone he knows follows. In the end it’s go with your gut. Dana: Humans are powerful data processing machines ourselves. Ideally we have people in those roles who are human synthesizing machines. Brenda: It’s synthesizing but then we react emotionally. Tapping into emotions that everyone feels, and then positive feelings toward a company that brings that up and supports it. Then to activate the emotion – what do I do with it? That’s a lot of what’s coming up in social/local/mobile. Theraflu brand tracks where the flu is occurring and can target their marketing there. Data helps activate the idea and drive it through the marketplace. Gio: It’s always been about listening to the customer. In the social media world, five years ago we talked about listening to the customer. We can listen better than ever with amazing tools, but don’t get caught up in the tools. Lars: Look up the Dear Sophie Gmail video. That’s emotions and customer insight at work. Dana: How many search marketers are frustrated they’re not contacted early enough upstream? Advertisers report their biggest challenges are no budget. The most important skillsets reported are in-depth understanding of target audience. How can search not be treated like a media channel down chain? Gio: Public relations is a field that has been denigrated over the years. The world of influence and marketing is about reputation. The general strategy is building influence with real relationships with customers. It’s validation of a long term trend toward understanding different touch points we have through mobility. Understanding ways to connect with customers. Lars: Search is often treated as a harvester after the idea is put out there. But there’s another way of looking at search. Come to the table with ideas of how search can affect the planning cycle from the beginning. New product, come with list of keywords. Take 10-15 keywords branded for the product. No one will be searching for these since it’s brand new and then watch the traffic spike over time. Watch it grow. Shift copy as it grows to calls to action, drive sales. Mark: That’s tactical, it’s not strategic. Brenda: Please come to the table earlier, being proactive. Don’t wait for someone to tell you what the keywords are. What are the secondary terms? What are the human behavior terms people are looking for that’s not the product name? And don’t just bring the data. What’s the so what? Why is this important from a human behavior standpoint. Google is changing it from a list to being the first place many people are seeing the brand. It’s becoming a richer media environment. How can we better use search to get first impression of brand and e-shelf presence to be most impactful? Mark: “Who” is understanding the consumer. “What” are we going to say to them? “How” are we going to do it? The “what” is where we’re having a disconnect. Dana: What are the top challenges? ANA says break silos and get money. How do you overcome those in org? Brenda: Maturity of client and their ability to use different marketing levers. There are still very traditional clients who need help understanding what digital can do for them. Others are very siloed and want everything but doesn’t understand which drives biz. Better are those who understand you don’t need to be in every channel but need to know which drive biz effectively. Gio: There are trends he’s seeing that will force integration. Social media folks would say every company is a media company. Social was seen as another channel, and channels weren’t integrated. Now we see a convergence in tools to create new touch points and integrated customer connection. Includes social, cloud, mobility, analytics. He’s trying to establish a point of view inclusive of the in-person experience, what you see in retail, in the workplace, it’s engaging the human consumer. The convergence of tools and knowledge of connecting with people in store means we have to start thinking of ourselves as retailers, not media. Mobility might be at the frontier. Devices are making this possible. We can think of what happens before she walks into the store, when she leaves the store. The problem, then, is disruption. Mark: The problem he sees is structural and cultural. How do you get the agencies to play in the same sandbox? P&G has gone to a model where a brand franchise leader is inside the company and a brand agency leader for the outside. Regarding culture, how do you build a successful brand? Brand champions who can shake things up. Part of it is reactive, sensing when things are coming up. Some is proactive, knowing when things are coming up. Lars: People and technology. No matter the challenge, you’ll always have your PR person say we’ve got this. Then you’ve got the search team saying we’re harvesting it all, spend money on search. Demand side says here’s the data! Every team wants a new platform, another agency, each has a personality and ego and that becomes a challenge. We need to find a synergy. If you can build relationships between display, search, they’re driving a group relationship that’s working for you. Dana: Vanguard Awards celebrates successes from overcoming political challenges.